One of the best ways to put your money to work is by investing in dividend paying stocks. I believe it is imperative that you put as much of your income as possible to work for you earning additional income. That is how you can grow your net worth and reach financial independence. For our family, in order to one day reach financial independence, we are investing over 25% of our income into quality companies that pay dividends. This year alone, we will earn almost $2,000 in dividend income. And in less than 2 years, we hope to have increased it to $3,000 in dividend income. 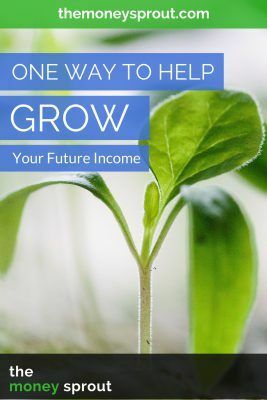 While $2,000 or $3,000 may not seem like that much, it is a solid foundation of sustainable income that will continue to grow. The quicker we can build this foundation … the faster it will compound and grow. Our family is now on a plan to save and invest about 25% of our income. This number happens to be $1,430 per month … which we plan to invest in dividend stocks. The $1,430 amount will now be our baseline each month, to let us know how we are doing. Anything above that … and we will have met our goal of saving 25% or more of our income each month. Anything below … and we are not meeting the goals we have set, which will slow our income building machine down. Once we consistently hit this mark each month, we hope to continue saving (and investing) a greater percentage of our income. Maybe in another year, we can push towards 30% of our income or higher? While each of the opportunities listed above can help grow our future dividends, I wanted to talk about unexpected income today. Over the last couple of weeks, we had a few examples of unexpected income that came in. In both instances, we immediately took action and put that money to work earning more income. One of the easiest ways to hit your investment goals, is to take advantage of income that comes in from outside your monthly budget. There is no doubt that hitting that $1,400+ in investments every month could be challenging. Things come up and life gets in the way. Extra car maintenance or home improvements could pop up. Who knows what unexpected expenses could get in our path? On the flip side though … there are also opportunities to invest unexpected income. In our case, we had about $625 of unexpected income over the past couple of weeks. This won’t be the case every month … but when it happens we need to take advantage of it. I got about $275 in cash of birthday money from relatives. Honestly, I feel that I am too old to get money anymore for turning another year older. But some family members still insist. I ended up taking $150 of that money and will use it to invest. I will use the other birthday money to replace a few clothes items and shoes that I need. Note – I almost never buy any clothes or shoes. About once a year I replace some items that have worn out and will do so again this year. I recently received a one-time work bonus of $350 post-tax. This was an easy decision when it comes to how to use it. It wasn’t part of our current budget, so the income is not needed to cover any expenses. The entire $350 was sent to our Robinhood investment account as soon as it hit our bank account. I really look forward to opportunities like this. Anytime I get extra bonuses at work or unexpected income … I almost always try and invest that money. With an extra $500 coming in ($350 + $150) to our budget, we are taking the opportunity to grow our income. Although we did not invest the entire $500 yet, we did use about half of it to buy stock. The investments we make will vary from month to month. However, I wanted to provide the details of this investment to show how we are growing our future income. You may be saying … so what? Another $7.20 in annual income is not a big deal. And on it’s own … it probably isn’t. But if I invested the other $250 in more ADM stock, we would generate just over $14 in future annual income. Or let’s say we invested all of our $1,430 this month in ADM stock. That would be approximately 33 shares of stock – give or take a share. Those 33 shares would push our future income up by $39.60 a year. Now we are talking! And the great thing about the $39.60 is that it should grow the following year into more income. If I do a good job of picking stocks, there is a possibility this income could grow by 6% or more. A 6% dividend growth on this income would mean that same income would grow to $41.98 in year 2. The point is that all of these little extra dividend income increases really add up over time – once given the chance to compound. Building a sustainable dividend income stream does not happen overnight. It is more of a marathon than a sprint. Unless you have endless amounts of money to invest early on, it takes years of monthly investments to build a sizeable income stream. That is how we are building our dividend income stream … one month at a time. We have a goal to invest 25%+ of our income each month – and hopefully a lot more in years to come. One opportunity to reach these goals is to take advantage of unexpected income. Birthday gifts and a one time bonus at work helped us to invest $500 additional last month. We have even used our tax refund to help increase our investments. Do you take advantage of unexpected income to invest? What examples of this type of income have you used to buy stock?